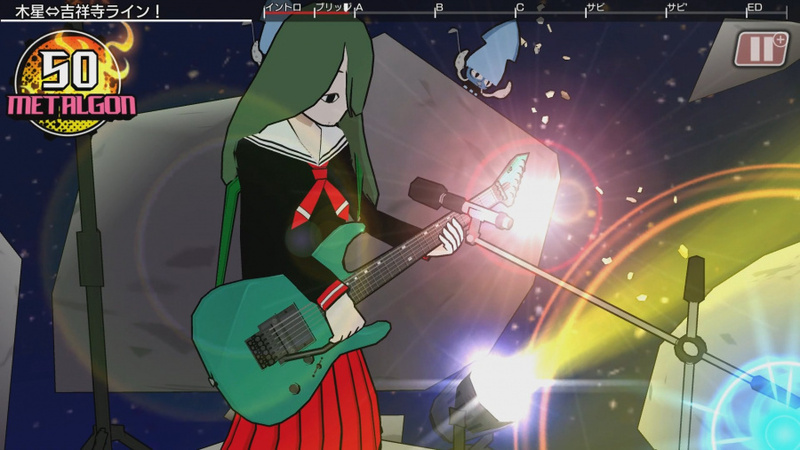 While the Switch’s region-free setup means it’s easier than ever to sample experiences from across the gaming globe, Nintendo’s new policy can’t help us overcome the language barrier involved in imports — and that’s one reason we were so excited to see the formerly Japan-exclusive Gal Metal on XSEED’s localisation lineup at E3 this year. 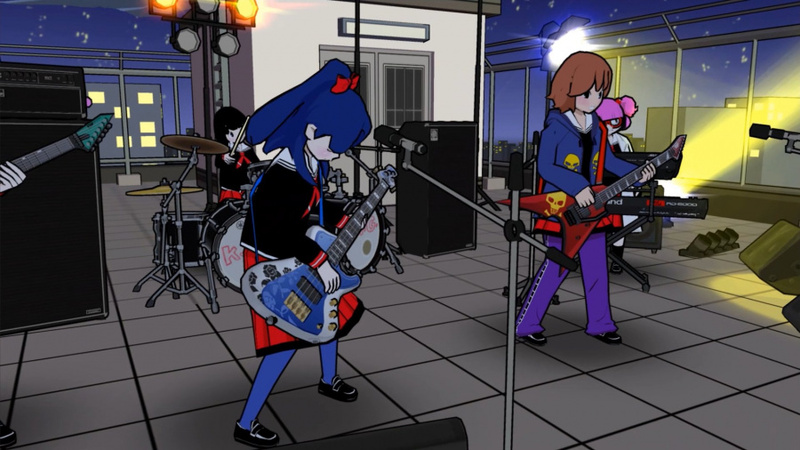 A freestyle, heavy metal rhythm game from DMM Studios and legendary Producer Tak Fujii, Gal Metal has players swinging the Joy-Con to create their own drum lines to ward off invading aliens. It’s also as fun as it sounds. After getting in a few rounds, we were lucky enough to get to sit down and chat with Fujii-san about Gal Metal, modern music games, playing in bands, and drumming from the heart. 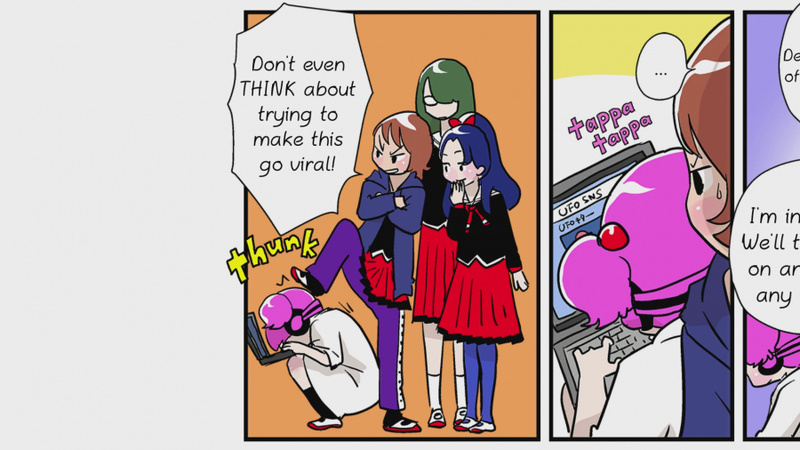 Nintendo Life: First of all, could you introduce Gal Metal for our readers? 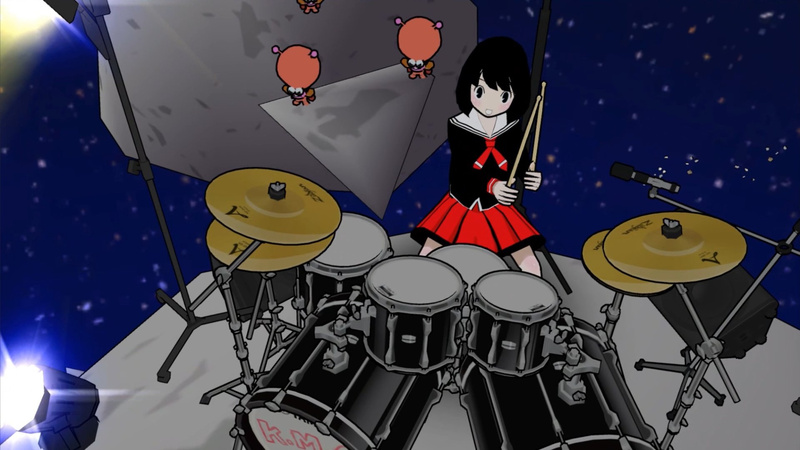 Tak Fujii: Gal Metal is a rhythm game where you play as the drummer in a heavy metal band. The reason why you play metal is that aliens are coming to Earth to destroy the humans, because the humans had sent a Golden Record up in the Voyager spacecraft with Earth music — and it was metal! Actually, history says that it was Johnny B. Goode on there, but I know the truth: it was heavy metal. So when the aliens heard that music, they just started headbanging and couldn’t stop, and the music ruined their planet, so they came to Earth for revenge. And because the girls in the band know that the aliens hate metal, they play metal against them. That’s the plot, and for the game side itself, you use the Joy-Con as drumsticks: you swing the right Joy-Con for the kick drum, the left for the snare, and both together to hit the cymbal. So by combining those movements, you make your own rhythm. Unlike other music games, there are no arrows flying on the screen, and the game doesn’t tell you what to do — instead, you have to remember each element of the rhythms and, well, unfortunately, you have to learn! Things like basic drumming — right, right, left, right, right, right, left. But in learning that, you’ll be combining techniques to build your own rhythms in the songs. There are many parts and structures in the songs, from intros to peaks and parts where you might just go crazy with double kick drumming, so it’s all up to you, it’s all the user’s choice. The concept of this rhythm game is that it doesn’t tell you what to do. In a regular rhythm game, if there are 100 players, they can each do a perfect combo, and it would give you the same song 100 times; but not Gal Metal. It’s never going to be the same. If 100 people play, they’ll have 100 different patterns. And players will want to learn from other players, and learn new tricks by watching other people play. That’s the main difference with Gal Metal. Because drums are the basic glue of music. All music around the globe has a drum. It might be actual drums, like a djembe from Africa or a conga from Latin percussion, or it might just be claps or stomps, but all music has rhythm as a basic element. So it’s a global concept to have that rhythm essence as a base, rather than playing guitar, or vocals, or anything like that. Also me personally, I used to be a drummer. 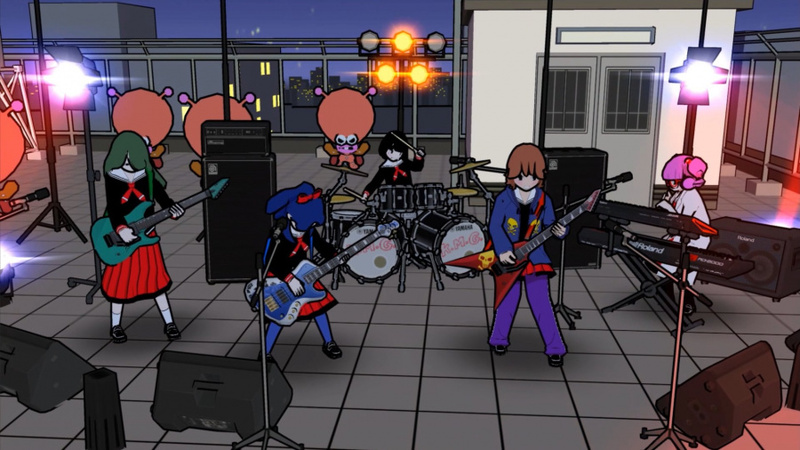 In addition to swinging the Joy-Con, Gal Metal also lets players drum on the touchscreen or with buttons. I was really surprised by how extensive those alternative setups are, with a full drum kit layout for each — what was the thought behind the different control options? Well, we decided to make this game on the Switch, because swinging the Joy-Con is so fun and physical. When we got the green light for the Switch, we were trying to figure out different combinations of movements to make different sounds — maybe pointing a Joy-Con to the right to do a kick drum, or pointing it left to hit a snare, and up for the cymbal, or something like that. But we figured out that that was too much, too complicated. So why don’t we just give players a kick, snare, and cymbal, since those are the basic elements when you learn the drums. Of course, we designed this game for all ages, but we know there are real drummers who are going to say, “Hey, you play the kick on the right side? That’s not drums, that should be the hi-hat!” or, “A cymbal with both hands?” or, “What about this, what about that?” So we knew that was coming, and we designed this game to work for beginner to advanced players. For advanced players who are used to MIDI controllers like keyboards or pads, maybe they have a good idea for understanding how to input real drums on this game. So if anyone is an advanced drum player and doesn’t want to just swing or make only simple sounds, then yes, there’s an option for those types of players where they can use the whole drum kit with the touchscreen or buttons. That’s the idea. And you can see quite a few crazy players on Twitter who are amazing at it! And with the motion controls, one important thing is that this is ‘air drums’. If you have a real physical drum, then yes, there’s a set timing when you hit the pad. But when you’re swinging the Joy-Con, every person has a different point of reference for where their air drum is. So maybe one player wants to play up here, and another wants to play down here — that means we can’t set any default setting. So that’s why we have these different modes, that we added in the Japanese version as an update: a Swing mode for beginners and a Drum mode for advanced players. The Swing mode uses motion, so as soon as it detects a swinging motion in the Joy-Con, it plays the sound. That’s more of a non-drummer style. For the Drum mode, it actually detects the stopping motion. So you have to stop your wrists where the pad would be, like a real drum, and that’s when the sound plays. In the original Japanese release, this was the default, but we heard so many complaints about it, like, “Hey we aren’t drummers, we’re just gamers!” so we added both, and we also made the sensitivity adjustable. The story seems to focus quite a bit on the bonds between band members. Can you talk a bit about the themes of the story, and what inspired you? For me, I was in a band in the 80s — the king of eras of bands — but nowadays, what is music about? Is it just pressing a button and turning knobs? Well, that’s a new way, and I’m getting old and I can’t understand it, but the feeling of a band is not just about playing by yourself. In other music games, it’s just you, and you can play great by yourself, but it’s not the band style — that’s about you and your mates. Of course, you play the correct notes, you get those basics, but the more important thing is that you talk to your band members, right? And sometimes it’s not about the music itself, maybe it’s about your school stuff, your teachers, your family, your college, anything, but then you know them, and they know you — that’s a band. And if that communication happens, you can make a different sound. That’s what a band is about. 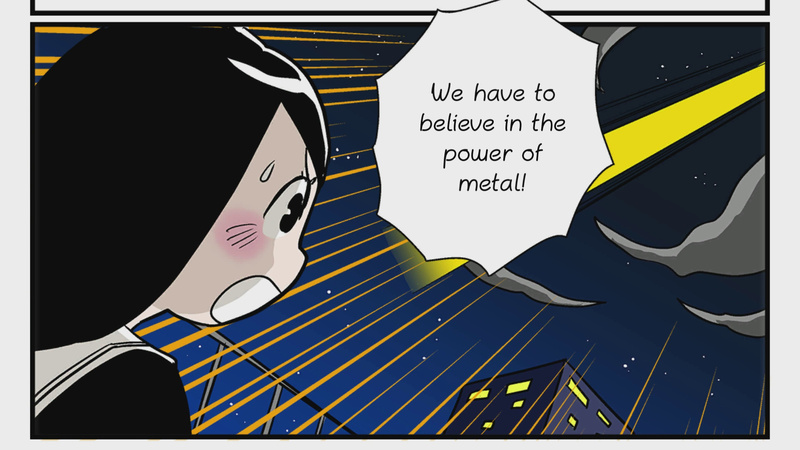 So in the main story of Gal Metal, we’re not focusing only on the music. We’re focusing on the girls’ school days — going to the café after school, or the movies, or shopping. That’s the feeling of the band. Knowing each other to make music. That’s the feel of a band, and that’s something I want to convey to the player. So I hear lots of opinions like “Hey do we need a real story? It’s a rhythm game, why don’t you put in more music instead?”, but it’s not just the music — I want to explain the band and the people in it. Speaking of music, Gal Metal has a really interesting soundtrack — classical pieces reimagined as heavy metal. How did you decide on that direction? Well, we could have gone with some licensed music like Metallica, or something similar. However, that would give you a complete answer for what a 100% perfect drum line for each song is. So again, if 100 people play a Metallica song in Gal Metal, then yes, there’s a right way — the way it’s recorded. And that’s not what I want expressed in the game. I want to give more freedom for players to build drum parts. But on the other hand, if we used all original songs, you might not know what to do. So we decided to use classical pieces, so at least you can think, “Hey I know this song, I know what’s coming next” — you’ll know where the peak is, where the intro is, and so it might be easier to understand how you can build a drum part to match the structure of the music. And of course, these pieces have lasted over 400 years, so they should be good! You’ve been working on game audio for over two decades now — how has that landscape changed since you began your career? It’s more interesting, I would say. When I started my career back in 1995 it was the PlayStation era, and the reason I chose to start my career in the games industry was thanks to CDDA, so I could compose my music on CD. Rather than 8-bit sounds, we can use real strings, and real guitars, and so on. But it’s not like composing for movies; games are interactive, so I wanted to try to compose interactive music. That’s how my career got started. And now, you have stereo surround sound, and the latest equipment is excellent, and the development environments and things like Unreal and Unity and other middleware are getting better and better, so we have so many more options. It’s much easier to express sound, and it’s wonderful because it means we don’t have to grab the main programmer and say, “Hey, here’s my sound.” and have them say, “Hey buddy do you know how long this bug list is? I don’t have time for your sound!” So there’s much more freedom for sound design. It’s become more open, and greater, and much better. What do you think of the state of music games today? Where do you see them going, and how do you see Gal Metal fitting into that picture? Since I was working with Konami, I saw when Bemani was born, and when Dance Dance Revolution happened, and how they handled everything. And what I saw from watching so many players was the inflation of skill. So when sequels happened, advanced players needed more and more difficulty, and what that did was close the entrance gate for beginners. They’re still great games, but it’s so hard for beginners to get started. So I wanted to do something different from that culture. Instead of that, it’s, “Hey, here’s a simple one” Even advanced players have only three notes, and you don’t have any fancy arrows you have to follow. It’s not your eye, it’s your heart. Even simple sounds can make a difference. So if anyone in sound development wants to try something new in music games, that’s a welcome option, and that’s something I really hope to see. 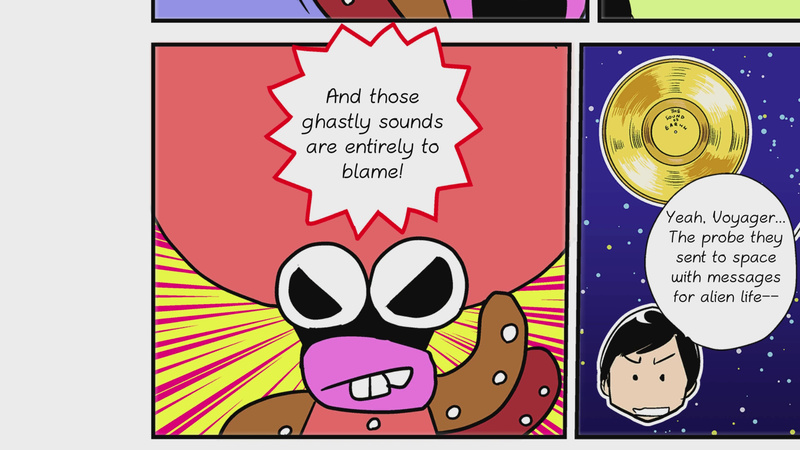 Gal Metal has such a distinctive visual aesthetic, with cel-shaded characters and manga-style cutscenes and text boxes. Can you talk about how you decided on that style? First of all, like I said, I really wanted to focus on the story of a band, and what band life is like. And usually in a Japanese game, if you focus on a story like that, you’re going to have text at the bottom and a little character model above it. And hey, we’re not talking about '80s games anymore! That’s like a text reading RPG game, so why don’t we look at what things like Uncharted or The Last of Us are doing instead? Of course, that’s not really the style of what we’re doing, but if we just kept that text box at the bottom with moving characters, people might get bored and just skip through. But right now, in this age, I see so many people on the train — Japanese trains, so it’s crowded, with people just facing their smartphones — but I see lots of people reading manga. People don’t skip manga! So that manga style is the best art style solution for us to tell the story itself in the best way. So once we picked a manga style, we asked Toshinao Aoki, a great manga artist in Japan, to do the designs. And because we used that style, we didn’t want to put those manga characters into realistic, shaded 3D models, playing realistic guitars — that would be weird. So we made them closer to a manga style, and that’s how that happened. In the prototypes, we tried many styles, including the text and characters, real 3D characters in nice lighting, and 2D characters, but we ended up with this style. 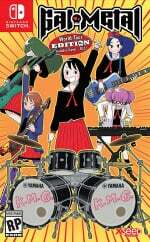 Now that Gal Metal is being released outside of Japan, were there any specific considerations that went into its localisation? Is there anything you wanted to do differently for the global release? We have a close relationship with XSEED. We are Japanese domestic developers, and I have experience living in the US, but I’m not from that culture, so I don’t know what’s the best look for this game overseas. So we asked lots of questions, and, of course, they’re professionals at XSEED, so they get plenty of feedback. We have a good relationship and communication, and there’s not really any special issues, so it’s going really smooth. How has it been working with the Switch? Do you have any other plans for the system in the works? It’s been really interesting. I mean, you can take this hardware out to a barbecue and start swinging the Joy-Con drumsticks, and maybe someone might have a real guitar to play with you — that’s our main concept with the Switch itself. It’s not a console game in your living room anymore, it’s something you can take out and play with your friends. So I would say for this game, it’s the best hardware so far. As for the future, I have to keep focusing on Gal Metal’s global release right now, so I don’t want to have any noise for any other titles. Until we successfully release this game, I won’t think about anything else. What are you hoping players will experience when they play Gal Metal? Just play in your style! Don’t argue with it like “Hey, there’s no interaction”; this is a free drumming game, so you, the player, will decide what to do. And if you don’t know, ask your friends! Play with your friends, and look things up on YouTube, or on Twitter, so you can find some great play styles to start with. I strongly recommend not to play alone. If you play alone, you may have a hard time to get started, and think, “I don’t know what to do,” or, “Hey, this is dumb bullsh*t!” So don’t do that — play with a mate. If you have any friends with experience in a band, that’s going to be a plus. But even without any experience, that’s fine — you’ll figure out what the best drumming is together. We’d like to thank Fujii-san for taking the time to speak with us. The interview text has been lightly edited for clarity. 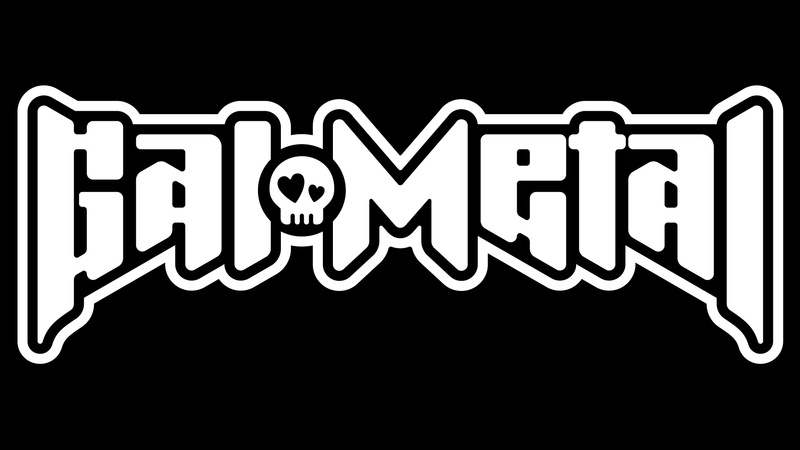 Gal Metal is slated for an autumn 2018 release in both North America and Europe. This looks bonkers but I like rhythm games, classical music, and metal, so I'll almost certainly pick this up if it's not too expensive. After watching Marty Friedman playing this game I was over excited! It was just amazing. For all my love for metal music, this game isn’t for me. This is one that I'm really looking forward to, and this interviee makes me want it even more. I didn't realize the music was going to be metal versions of classical music, but as any metalhead can tell you, classical and metal go amazingly well together. Bring it on! !